Miya Nikole Robinson is an Animator and Film-maker based in Providence, Rhode Island. Originally from South Padre Island, Texas, Miya went on to study animation at the Rhode Island School of Design. I am a fabricator of worlds, an instructor of metal-boned beings, and a baker of heads born of moist earth. I capture their movement through the preservation of light, allowing their bones to dance before you and tell the story excavated from the rubble. I am a creator of realms and a mother of worlds. You majored in animation at Rhode Island School of Design and graduated in June of 2017. What inspired you to pursue the arts in college, specifically something so niche? When you look at the world around you, what do you see? Do your eyes surpass the surface and see the magic that lies beneath? As a young child, I drifted between the two worlds: the seen and the unseen. I ventured into the uncharted lands of the imaginary and discovered the beauty that lurked within. How could I show what I had seen? How could I tell of the worlds that invited me in and welcomed me even though I was alien to their land? I went beneath my mother’s desk and stole all of her printing paper and began to construct, create, and breathe life into the images that came forth from my hands. Art became the vessel that could travel through the divides. It allowed me to bring the worlds I knew to those who hadn’t seen their beauty. My hands became the physical translation of this visual language that only I knew. As I grew older, pens and pencils ceased to suffice. This stationary, two-dimensional expression was no longer enough- I needed more. It seems your preferred medium of animation is claymation, what drew you to claymation and how does it differ from other animation mediums? There’s a beauty in the process of Claymation that you don’t see in the other branches of animation. This one holds a beauty that is human because it gives purpose to error. It gives purpose to the depressions one sees resembling fossils caused by fingers pressing into a layer of soft clay, or the gentle brush of skin against fabric causing the wrinkles to travel like ripples in a still pond. Everything within the medium has a story. Everything has a meaning and to me, that’s beautiful. The soundtracks to your animations bring a distinct and eerie mood to your work. What does the creative process look like for scoring your animation? Sound design is one of my favorite stages in a project. You can invoke any emotion with the right score. The visuals set the stage, but the sounds tell the story. With that said, in every step of my process, there is one commonality: I let the art speak to me. I let it tell the story, I just aid its translation. You have a particular fascination with darkness and incorporate it into much of your work. Where does this interest stem from? Are you scared of anything? Within my art, I’ve always been drawn to the shadows. Not only do they conceal, but they reveal as well; a true beauty to the beast. I’ve never been truly scared of anything. I find the fears that lurk within our wildest dreams to be misunderstood creatures longing for a place to rest their heads. In my animations, they no longer have to search for a haven; they’ve found home. As anyone could tell you, I’ve been a Burton fan for as long as I can remember. He and I understand that there is a home for every creature, no matter how strange. I am also a lover of a painter named Michael Hussar, who can turn something wicked into something wondrous. I’ve been a lover of folklore, psychology, and all things curious. Anything can inspire me really, even the inanimate. Besides, what’s the inanimate to an animator? We breathe life into the seemingly mundane. 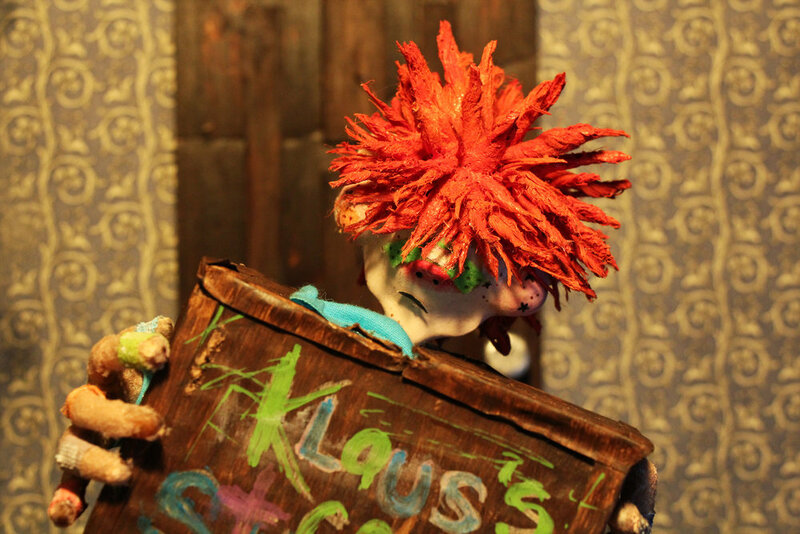 Where do you see your claymation taking you in five years? What does your ideal career within animation look like? I hope to be in a studio somewhere forging worlds from items deceptively ordinary, like some ethereal troll who’s soul purpose is to bring life into a world quite absent. After I serve in the dark depths of the stop motion production labs, I hope to see my stories on the big screen; causing fright with a bit of insight.